Why ‘Should’ is a Dirty Word. Another module that we have here at ICA, speaks directly to this question of “should,” the module is called “Commitment vs Trying”. So, moving from a place of trying into a place of commitment. When I’m working with my own clientele I look at the word “should” as a good indicator of a change being needed. It can either be that you need to take action and you’re just waiting and you haven’t committed fully to taking that action, or maybe it means that it’s not the right action for you whether this is, “I should have done this” or “I should not have done that.” It’s really a lot about doubt. When looking at this whole concept of committing versus trying – if you are trying, there’s doubt. If you’re in a place of trying and a place of should, there’s a lot of doubt there whether you think you can’t do it or you really don’t want to do it. What happens then, the result is failure. Whereas when you look at commitment, you are actually taking that action. What we’re talking about here is either failure or success. Often, the “should” can be a good indicator that we’re not on the right path, or it can be the indicator that success is right around the corner. It’s really impossible in this world to commit to everything, and I think that’s often where a lot of our “should” come from. We should be doing this because other people are doing it or we are told that we should do this. The most important thing first whenever I’m working with a client that has the should issue, is to have them look at their desires, their goals in life. I know that we’ve said this so many times before but one of the first things that we do with many clients is we’ll do some needs assessment, helping them to locate what it is that they really want in their life, and what are their strengths. So, needs and strengths for a brand new client. 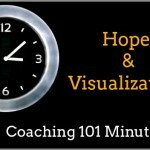 Then we use that as a guide post throughout the entire coaching sessions. If you’ve done this with a client, say six session beforehand, and now this whole concept of “should” are showing up. It really is a good time to look back and to see, are the “should” a sign of an impeding failure, or is it a sign of a success right around the corner? We’re going to look back at what their values are in life and what their strengths are. It’s really helping to have that dialogue open up so that your clients are not over-committing themselves or they aren’t stuck in a loop of just trying to do something. The first step is just to look at what you’re values are. If you’re thinking for yourself, what is it that I need to do? Should I do this or should I not do this? You are the only one that can answer that question. So, look back at what your ultimate goals are. Does this fit into? Could this be part of the puzzle? The biggest thing is not to be stuck in the trying standpoint because that will equal failure – either commit or don’t commit, which are both a commitment. At the end of the class, we opened up for Q&A, looking at anything from ICA to coaching in general. There were a lot of questions that were bought up around credentialing and certifications. 1) What is the difference between a coaching certification and a coaching credential? 2) What is the importance of certification as a coach? 3) We also looked at the background of successful coaches as in what do they do beforehand, before coming to coaching. We answered all of these question and many more. 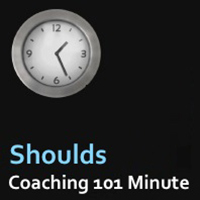 If you’re interested in learning more about these question or about “shoulds,” come along to an upcoming coaching 101 teleclass. It’s a free offering, a chance to sample our classes and to learn some information about coaching and the coaching industry in general.